Until the communist takeover in 1975 Luang Prabang was the royal capital of the Kingdom of Laos, and has the wonderfully redolent architecture you’d expect from the capital of such a graceful and colourful nation. 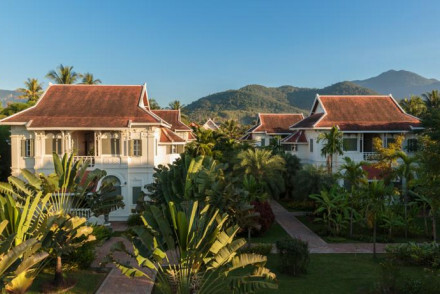 Its unique beauty, the bustle of its markets and the gentleness of the population - known for its numerous monks - make this one of the most popular tourist destinations in Laos, so there’s plenty of accommodation competing to be included on our Guru’s list of the best places to stay in Luang Prabang. Luang Prabang’s traditional feel is helped by its 11:30 curfew, so if you want to stay up any later than that you’ll need your choice from our best places to stay in Luang Prabang to have its own bar. But it’s worth getting up early in the morning with the rest of the city to enjoy the procession of monks and the gleam of the golden temples in the early morning sun. Hundreds of monks and novices live in Luang Prebang, in the hundreds of temples and monasteries, most of which are in the main part of the city between the Nam Kahn and Mekong Rivers, below the steep hill where you’ll see one of the city’s largest wats, Wat Chom Si. Wat Xiang Thong is another impressive local landmark covered in an exceptionally beautiful tree of life mosaic. The Royal Palace Museum is also unmissable, a blend of Lao and French design with wonderful Gauguin-esque murals and plenty of interesting exhibits labelled in English. Visitors will also want to explore the Handicraft Night Market and taste as much of the local cuisine as possible! Get up at dawn to watch the procession of monks peacefully make their way through the city. Visit one of the many hundreds of temples and monasteries! Explore Wat Chom Si and marvel at her treasures. Check out the Tree of Life mosaic at Wat Xiang Thong! Marvel at the Royal Palace's fascinating blend of Lao and French design. Head to the Handicraft Night Market and taste the local cuisine! Our pick of the best places to stay in Luang Prabang has something for all tastes and budgets, whether you're here on a very tight budget or looking for five star luxury. Mekong Villa @ Ock Pop Tok cannot be beaten when it comes to value for money. 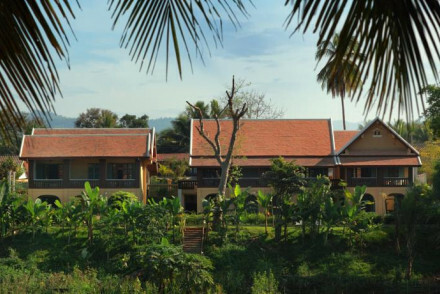 The four atractive rooms are individually designed and sit amid a craft centre overlooking the mighty Mekong. It's slightly off the beaten track but you can borrow a bike for exploring or jump on a free tuk tuk into town! 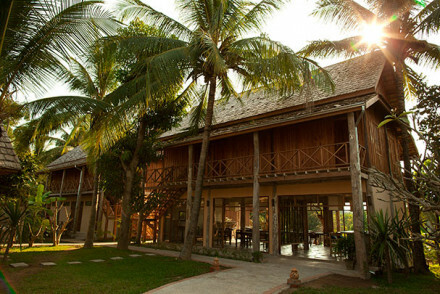 Indigo House Hotel offers traditional Laotian style with a contemporary twist. It's got a roof terrace with a view, a cafe for healthy snacks and it's walking distance to some of the city's top sights. My Dream Resort is a charming collection of bamboo bungalows overlooking the Nam Khan river. It's a bit out of town, but perfect for a peaceful stay that won't break the bank. 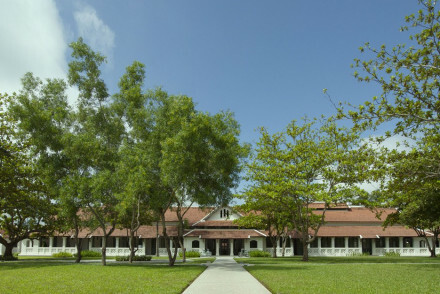 Belmond La Residence Phou Vao has similarly grand credentials and will not disappoint. Perched atop a hill just outside town, you'll find wonderful views, stunning interiors and an infinity pool to die for. The restaurant is highly recommended too. Hotel de la Paix is a cluster of Colonial buildings cleverly converted to provide 25 luxury suites, each with private garden, spa style bathroom and some with their own plunge pool. Satri House is a lovingly restored property not far from the centre of town. Rooms are beautifully decked out, some with four posters, there are lovely gardens with a pool and a fab spa with herbal steam room. 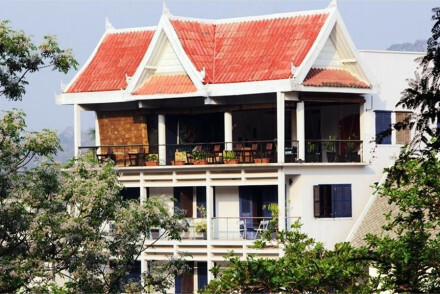 Luang Say Residence boasts twenty three luxurious suites with romantic muslin draped four posters and private terraces. There's beautiful lush gardens dotted with lily ponds and a large pool and an excellent fine dining restaurant. The Apsara is a traditionally Lao property just off the calm of the Mekong River, decorated with plenty of dark wood and brightly coloured silks. The 13 rooms have lovely four poster beds, but also the benefits of a modern bathroom, plus there’s an excellent restaurant. 3 Nagas boasts a restaurant that's been voted the best Lao cuisine in town, plus you'll find spacious rooms and suites, verdant gardens and you're in walking distance of at least thirty UNESCO Heritage temples! The Sanctuary is located in historic buildings in the centre of the city. Elegant rooms overlook the gardens and lily pond and there are connecting rooms available for families. It's great value too. Sala Prabang spreads its rooms amongst seven historic townhouses and they've kept many original features including exposed stone walls and beamed ceilings. Families are welcome here and there's no additional charge for an extra bed if your child is under 7! 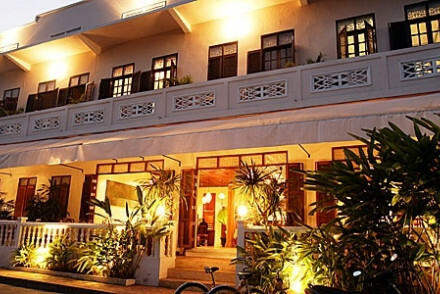 Le Sen is an ultra stylish boutique hotel a short tuk tuk ride from town. Come here for minimalist interiors, an inviting pool and delicious food. Kiridara Hotel offers modern elegant accommodation in a hillside location, so you've got the views too. There's a dreamy infinity pool, sleek interiors and seriously good spa. 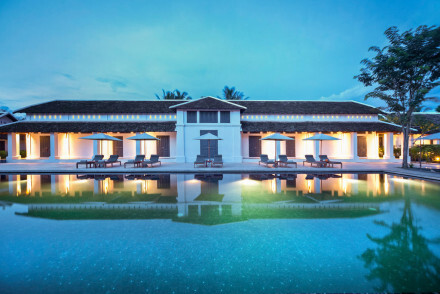 Apsara Rive Droite is ideal for a chic stay if you don't want to be in the heart of the action. And it's got a great restaurant. 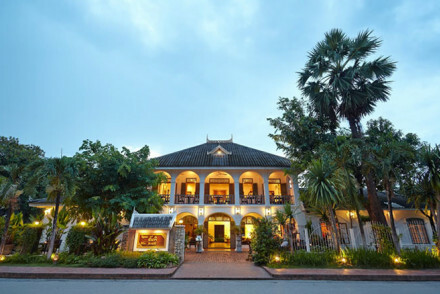 The Belle Rive Hotel is a conversion of three beautiful Colonial buildings overlooking the Mekong. You'll find high ceilings, rosewood furniture and local textiles - all very evocative of days gone by. 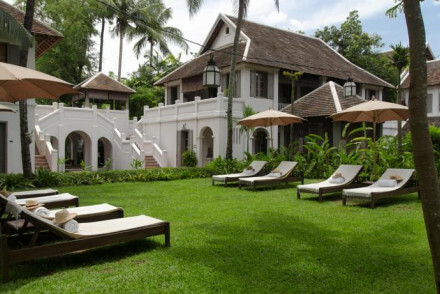 Ansanga Maison Souvannaphoum is a colonial beauty located in the ancient heart of Luang Prabang. Stunning exteriors and interiors, plus an excellent spa and pool. Villa Santi is a converted 19th century villa where classic french colonial and traditional Laotian design has come together in style. There's a small plunge pool and the restaurant's headed up by the daughter of the last King's head chef. Villa Maly is yet another colonial pick - a property that was once owned by local royalty. Rooms are airy and decorated with a 1930s vibe and there's a wonderful pool for unwinding after you've had your fill of temples! Mekong Riverview Hotel is the place to stay if you want a top riverside spot. There's wrap round balconies for drinking in the views, and the rooms are elegant and sophisticated. Our partner Booking.com has a wide range of villas and apartments. The best time to visit is between October and April, when the weather is at its warmest and driest. Fly to Bangkok, get a connection to Luang Prabang International Airport. Four unique rooms sit in the grounds of the Ock Pop Tok Living Craft Centre, perched on the banks of the Mekong. Spacious and chic & adorned with the beautiful textiles which are made on site. Make the most of complimentary bikes and a free tuk tuk into town. Off the beaten track but well worth it! Sights nearby - A free daily shuttle bus runs between 8am and 5pm and takes you to the centre of town. A place of calm set on the banks of the Nam Khan River. 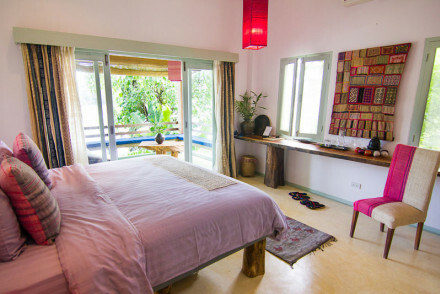 Bamboo bungalows give a laid back feel yet your are only a 15 minute cycle away from town. Rooms are spotless and the staff friendly and efficient. Well priced plus the owners donate a portion of the profits to local projects. A great find. A traditional Laotion townhouse with a contemporary twist. White washed walls and crisp linens are decorated with local textiles. The rooftop terrace enjoys great views whilst the cafe serves up healthy dishes. Many of the town's sites are within walking distance. Ideal for those on a flyby visit. A traditional Lao (heuan) property located just a stone's throw from town, but a world away on the tranquil waters of the Mekong river. Dark woods are accented with bright colours and ornate silk fabrics; four poster beds, modern bathrooms and most have balconies. There is an excellent restaurant. Local markets - Whether or not you are here for shopping the Phu Si market is a visual and veritable feast! Cooking classes - Learn the local secrets at the Tum Tum Cheng on Sakkaline cooking school. Sights nearby - The Royal Palace and Phu Si temple are both must visits in Luang Prabang. Walkways weave over the lotus ponds at the entrance to this 26 room boutique hotel. Rooms are individually designed combining the owners antique collection with a modern clean touch. Just a 3 minute walk to the town centre, yet whilst sat in tranquility by the pool, this is near impossible to know. Large airy rooms with private terraces face out onto the manicured tropical gardens.The decor is minimalist and clean. 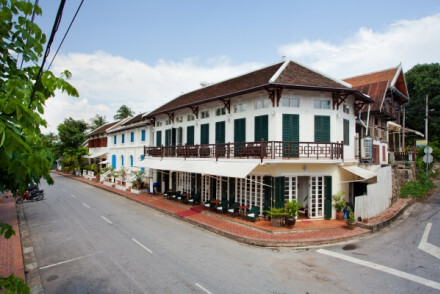 The hotel has been constructed around three historic royal buildings. A sit out terrace overlooks the lotus pond. A place of complete calm in an excellent central location of town. Seven historic townhouses carefully converted into a boutique hotel whilst maintaining their charm. Some rooms are on the small side but all have original touches like exposed stone walls and wooden beams. Modern bathrooms are a welcome addition as are the delicious local dishes on offer. Value chic - Stylish, sympathetic interiors with a sympathetic price tage! Ultra stylish boutique hotel, a tuk-tuk ride from town. The style here is predominantly minimalist chic with dark wood floors, a monochrome palette and all mod cons. The restaurant keeps everyone happy with a mix of International and Laotian cuisine. A smart stay just outside the centre. Three riverside colonial houses refurbished with exquisite care. Rosewood furniture, high ceilings and Loatian textiles give an elegant feel evocative of a bygone age. Take a drink on the terrace overlooking the river and sample from traditional Laotian dishes. Simple elegance. Four poster beds - For romantics. 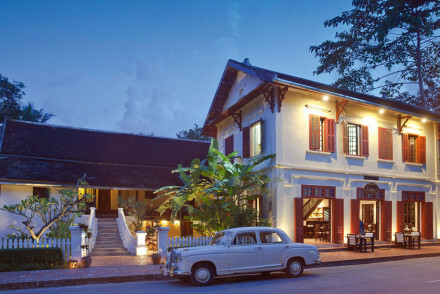 A converted 19th century villa styled in a blend of french colonial and traditional Lao design. The opulent suites are worth spending your buck on and the spa worth your time. The plunge pool is small but serves it's purpose. The restaurant is headed by the daughter of the last king's private chef. A chic hotel built on a hillside giving exceptional views and an out of town feel. Rooms are modern and elegant with large windows making the most of the scenery. Laotian flavours are worth sampling with the hotel's tapas style menu. The infinity pool and spa make it a spot difficult spot to leave. 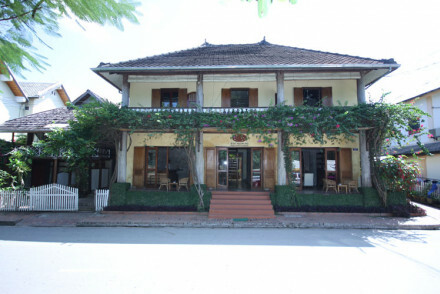 A converted colonial house set in the ancient town of Luang Prabang. 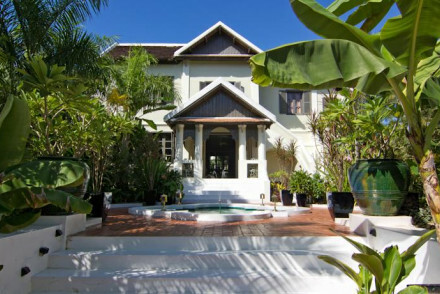 French elegance meets Loas charm in this quiet, centrally located spot. An excellent spa and well kept pool are on offer. Ideally placed within walking distance of temples, restaurants and the river there's plenty to keep busy. A lovingly restored, owner managed, colonial house within a 10 minute walk of central Luang Prabang. Set within beautifully manicured gardens the hotel itself is lovely to walk around. The spa is noteworthy particularly the herbal steam room. Ideal for a romantic break. Set in the primary position of Luang Prabang peninsula, where the waters divide between the Mekong and the Nam Khan. Owner managed, the finer details haven't been forgotten. Some rooms have wraparound balconies and spa baths; all have remote controlled beds. The ideal spot for a riverside relaxing. 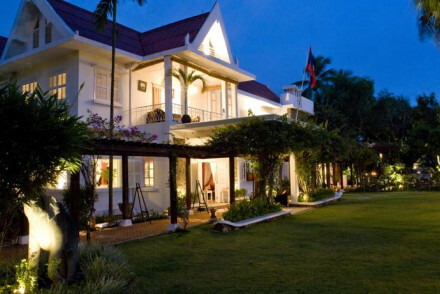 Set on the opposite bank of the Nam Khan River yet within easy access of central Luang Prabang. A beautifully designed property with subtle, clean design. Harbored in the midst is a delightful restaurant. The perfect combination of town life and quiet country living. A renovated mansion comprising of 23 suites. A large pool sits at the centre with manicured gardens and ponds covered in lilypads. 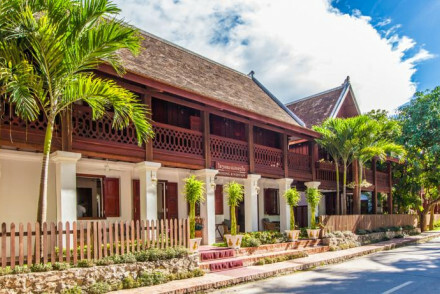 Rooms have traditional Laotian wooden floors and colonial style furniture. Beautifully presented Asian and European dishes are served whilst the bar has a bistro feel. Set across three historical houses in central Luang Prabang subtly renovated to accommodate modern comforts whilst maintaining its charm. 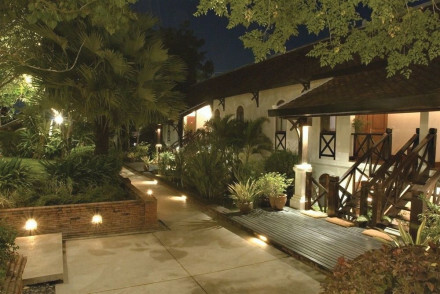 A central courtyard houses the excellent restaurant voted the best Lao restaurant in town. Access to the hotel's classic car collection sets this place apart. A converted colonial era hotel once lived in by royalty. Now decked out with 1930s decor this is a tranquil spot with airy rooms and a beautiful outdoor pool. Ideally situated within easy reach of Luang Prabang's temples and restaurants but also a perfect abode for completely unwinding. 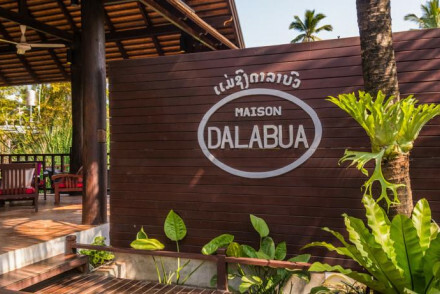 A cluster of French Colonial structures with strong Laotian design, cleverly converted into 25 suites. Each suite provides the ultimate in privacy with gardens, spa-like bathrooms and some even boast plunge pools. It doesn't come cheap but it is the perfect romantic getaway. 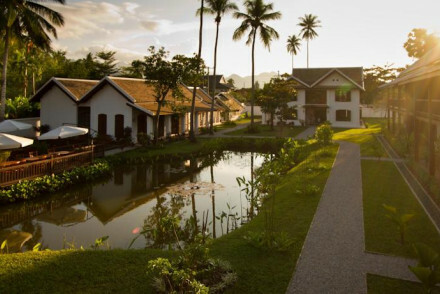 An elegant colonial hotel in a secluded setting just outside Luang Prabang. Part of the Belmond group it ensures high standards and attentive service. Perched a top a hill giving panoramic views best enjoyed from the infinity pool.The Laotian cuisine comes highly recommended. 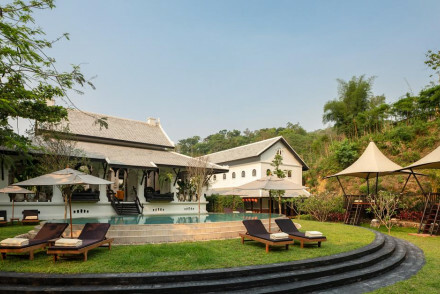 A stunning luxury hideaway in the jungle-clad hills outside Luang Prabang. 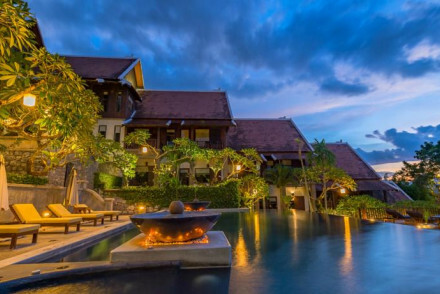 With villas, suites and hilltop tents decked out in an elegant mixture of bold Laotian style and French furnishings. The restaurant serves tantalising Royal Laos cuisine with local organic ingredients. Remarkable. An old hospital beautifully renovated into a hotel comprising of 24 suites.As with all Anamresorts properties the spa is excellent and luxury is taken to the next level. Service is attentive without being intrusive. Some suites feature private swimming pools. Ideal for completely unwinding.